"He who fails to plan is planning to fail." Winston Churchill. Competitors are a great place to look for information and all companies have them. The three circle model (Urbany and Davis 2009) is a great place to start your assessment of your competitors in this respect. It is possible to understand their marketing strategy simply from their on-line presence, giving an idea of their messages, target audience, keywords etc. You can do an on-line search relatively easily but many competitor analysis stop at this and yet few businesses work completely on-line and their impact is not always predictable or consistent. 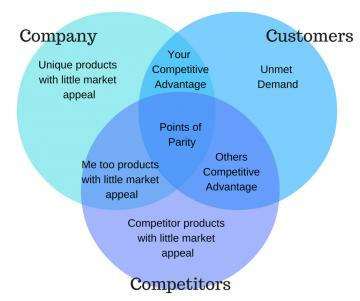 Although a basic competitor analysis based on the 4Ps (or 4Cs if you prefer) may be sufficient for a marketing strategy of business plan, Planned Market Research can go further and find out other information on market share, profitability and sector strengths. A thorough competitor analysis can help with innovation (particularly in conjunction with the 3 circles tool) as well as giving you a good background to judge your own strengths and where there may be opportunities in the future (e.g. helping to complete a SWOT analysis). Planned Market Research has its own questionnaire that looks at competition in the terms of customers, rather than specific quality frameworks and uses the Jobs to Be Done framework to help highlight where additional current and future competition may come from. what your customer is thinking? © Copyright 2019, Planned Market Research. All rights reserved.